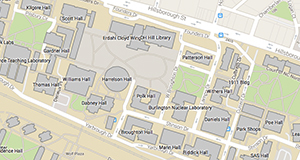 Gan, S., Zakaria, S., Ng, P., Chia, C. H., and Chen, R. S. (2016). "Effect of acid hydrolysis and thermal hydrolysis on solubility and properties of oil palm empty fruit bunch fiber cellulose hydrogel," BioRes. 11(1), 126-139. Cellulose hydrogel was produced from pretreated oil palm empty fruit bunch fiber (EFB) that went through acid hydrolysis and thermal hydrolysis. The pretreated EFB was dissolved in LiOH/urea aqueous solution using the rapid dissolution method and was subjected to a crosslinking process with the aid of epichlorohydrin to form hydrogel. The effects of both hydrolyses’ time on average molecular weight (Mŋ), solubility, and properties of EFB hydrogels were evaluated. Both hydrolyses led to lower Mŋ, lower crystallinity index (CrI) and hence, resulted in higher cellulose solubility. 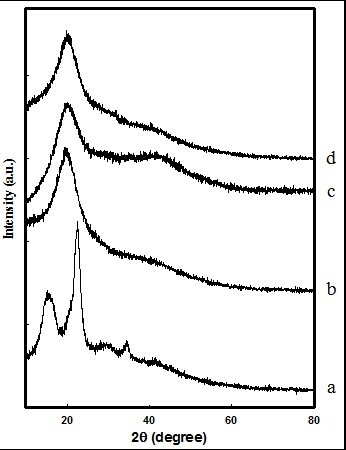 X-ray diffraction (XRD) characterization revealed the CrI and transition of crystalline structure of EFB from cellulose I to II. The effects of hydrolysis time on the transparency, degree of swelling (DS), and morphology of the regenerated cellulose hydrogel were also investigated using an ultraviolet-visible (UV-Vis) spectrophotometer and a Field emission scanning electron microscope (FESEM), respectively. These findings provide an efficient method to improve the solubility and properties of regenerated cellulose products. Malaysia is rich with renewable natural tropical forest resources, and it is the largest producer and exporter of palm oil in the world. It has been the producer of about 40 to 60% of all global oil palm over the last 25 years (Fan et al. 2011). Oil palm empty fruit bunch fiber (EFB) is the main by-product in the palm oil industry and is an abundant lignocellulosic waste (Kim and Kim 2013). It has been widely applied in many industry applications such as making tiles, pulp and paper, particleboard, medium density fiber board, etc. However, there is a restriction on cellulose application since it is hard to dissolve in general solvents. The specific structure in cellulose tends to arrange the polymer chains into tightly packed, highly crystalline structures that are water insoluble and resistant to depolymerisation (Carpita and Gibeaut 1993). The solubility of cellulose mainly relies and varies on its average molecular weight (Mŋ) (Gan et al. 2015b). Therefore, the pretreatment on cellulose is required to disrupt the lignin seal and dislocate the crystalline structure of cellulose (Gan et al. 2015b; Mosier et al. 2005). Gan et al. (2015b) found that the liquid hot water treatment reduced the molecular weight of cotton linter, thus achieving a better solubility of up to 91.31 % and 94.19 % in NaOH/urea and LiOH/urea aqueous solution, respectively. Zhang et al. 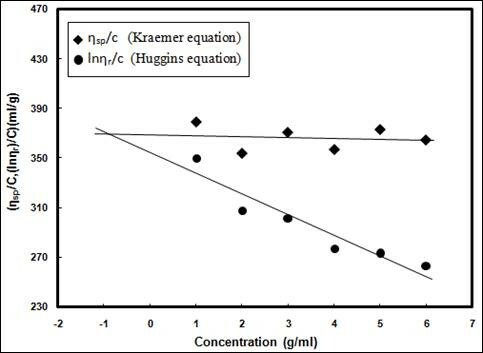 (2010b) reported that the aqueous NaOH system with either 7/12/81 NaOH/urea/H2O or 9.5/4.5/86 NaOH/thiourea/H2O in compositions were able to achieve optimal solubility for cotton linter dissolution. Acid hydrolysis is known as a direct hydrolysis mechanism used for biomass conversion. In general, the hydrolysis mechanism and cellulose dissolution are controlled by the hydrogen ion concentration (H+) (Najafpour et al. 2007). During the acid hydrolysis mechanism, acid is penetrated into the disorder regions where the splitting of glucosidic bonds leads to a rapid decrease in the degree of polymerization (Fan et al. 1987). Thermal hydrolysis is a process that uses water at elevated temperatures and high pressures to maintain its liquid form in order to promote disintegration and separation of the lignocellulosic matrix (Brodeur et al. 2011). Commonly, introducing the hydrolysis mechanism of lignocellulosic materials into its corresponding monomer sugar has been done using acid, and enzymatic, and microbial hydrolyses. The pretreatment affects the re-localization of lignin on the cellulose surface. 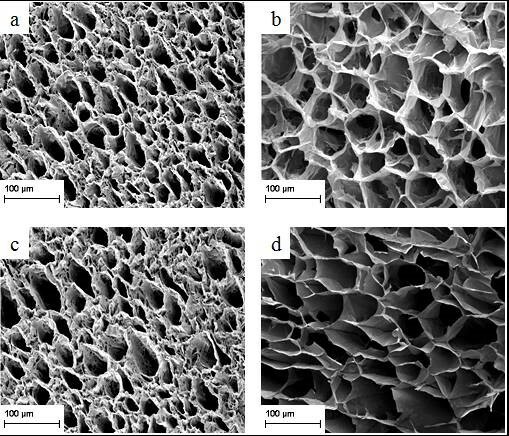 The accessibility of the cellulose structure can be enhanced due to the physical changes in cellulose by increasing the pore size and accessible area (Ruiz et al. 2013). In a urea alkaline system, soda with urea or thiourea mixture at different weight ratios in water have been shown to dissolve up to 5 wt% of cellulose at temperatures as low as -12 °C (Gan et al. 2014). The existence of the Weissenberg effect in urea alkaline systems, which happens within 30 seconds, might cause it to be the fastest cellulose dissolution. The Weissenberg effect is the effect shown by clastic liquids during rotary stirring. Compared to those costly cellulose dissolution systems such as ionic liquid and NMMO, the urea-alkaline system dissolves cellulose directly and quickly in subzero temperatures. In fact, the normal cellulose dissolution will slow down the diffusion based on the dissolving solvent and cellulose interchange ability, but its dissolution rate can only be enhanced through heating (Cai et al. 2008; Luo and Zhang 2013). A hydrogel is a water-insoluble polymeric material that can absorb large amounts of water through the formation of a three-dimensional network of hydrophilic polymer, leading to water swelling of the polymer. Hydrogel can be obtained either through the physical (ionic or hydrogen bonding) or chemical (covalent bonding) interactions (Chang et al. 2010; Koschella et al. 2011). Cellulose hydrogel possesses a few unique properties including high permeability, biocompatibility, biodegradability, and nontoxicity (Chang et al. 2008). It has been extensively used in different fields including food, optical, biomedical, tissue engineering, water treatment, agricultural, and personal care products (Chang et al. 2008; Koschella et al. 2011). Based on numerous previous studies, acid hydrolysis and thermal hydrolysis on several different biomasses have mainly focused on its sugar yield and the production of sugars that organisms can ferment to ethanol and other products (Jacobsen and Wyman 2000; Aguilar et al. 2002; Lavarack et al. 2002; Rodrı́guez-Chong et al. 2004). However, there has been limited investigation into the effects of acid hydrolysis and thermal hydrolysis on cellulose solubility and regenerated cellulose products. In order to find a method to reduce Mŋ so as to improve the cellulose solubility, the objective of this work was to investigate the effects of acid hydrolysis and thermal hydrolysis on the Mŋ, solubility, and properties of the EFB cellulose hydrogel. EFB was obtained from Szetech Engineering Sdn. Bhd. The 98.0% analytical grade of lithium hydroxide monohydrate (LiOH∙H2O), epichlorohydrin, cadmium oxide (CdO), ethylene diamine solution, and 98.8% sulphuric acid were obtained from Sigma Aldrich. The sodium hydroxide and urea were obtained from R & M Chemicals. The sodium chlorite (NaClO2) with a purity of 80% was obtained from Acros Organics. All the chemicals were used without further purification. The EFB was soda pulped at the Forest Research Institute Malaysia (FRIM) in a digester with a 25% NaOH concentration at 170 °C for 2 ½ h. The EFB pulp was bleached using the four stage bleaching method, DEED. The D process was carried out starting with 1.7% sodium chlorite at 80 °C for 4 h, and the E process was an alkaline treatment with 4 to 6% NaOH solution at 80 °C for 3 h. After each single stage was performed, the sample was washed until it became neutral in order to remove the bleaching chemicals. The bleached EFB pulp was then dried at 105 °C for 24 h, and stored in a dry place. For the preparation of acid hydrolysis EFB pulp, the bleached EFB pulp was immersed and stirred in 10% H2SO4 solution at room temperature for 2 h, 4 h, and 6 h, respectively. The hydrolyzed EFB pulp was obtained under atmospheric pressure and washed several times with deionized water to neutralize it. The acid hydrolysis pretreated sample was oven dried at 80 °C for 24 h, and stored in a dry place. The acid hydrolysis EFB pulp samples were referred to as AHE-2h, AHE-4h, and AHE-6h according to their reaction times. The thermal hydrolysis EFB pulp was produced using an autoclave immerged in a hot oil bath. The amount of urea and cellulose used to prepare thermal hydrolysis EFB pulp was a 1:1 ratio. The urea was added in the process in order to improve the solubility of cellulose in the rapid dissolution method. The hydrated urea, EFB pulp, and a certain amount of distilled water were stirred at room temperature for 30 min. to produce a homogeneous mixture. The autoclave was filled with EFB/urea mixtures and closed tightly before being immersed in the oil bath at a temperature of 140 °C for 2 h, 4 h, and 6 h, respectively. These thermal hydrolysis EFB samples prepared at different reaction times are coded as THE-2h, THE-4h, and THE-6h, accordingly. The thermal hydrolysis EFB pulp was then washed with distilled water several times with the aid of a vortex shaker, and centrifuged to remove the residue of urea remaining on the EFB pulp. The thermal hydrolysis EFB pulp was then dried in a vacuum oven at 80 °C for 12 h, and stored in a dry place. where kK’ is a constant for a given polymer at a given temperature in a given solvent in the Kraemer equation, while kH’ is a constant for a given polymer at a given temperature in a given solvent in the Huggins equation. The quantity ŋsp/c is the reduced viscosity and ln ŋr/c is the inherent viscosity of the cellulose. A LiOH/urea aqueous solution at the weight ratio of 4.6 wt.% LiOH : 15 wt.% Urea : 80.4 wt.% H2O, was prepared and stored at -13 °C for 6 h. 3 wt.% of each cellulose sample (EFB pulp, AHE samples, and THE samples) was dissolved in LiOH/urea aqueous solution using the rapid dissolution method. The EFB cellulose solution was stirred for 5 min. to obtain a yellowish transparent cellulose solution. The cellulose solution was subjected to centrifugation at 10000 rpm for 5 min. at 5 °C to remove air bubbles, and to separate the dissolved cellulose solution and undissolved cellulose. During the crosslinking process, 5% of the epichlorohydrin solution was dropped carefully into the cellulose solution and was stirred homogeneously until the hydrogel was formed. The obtained hydrogel was washed with deionized water to remove the excess LiOH and urea. The cellulose hydrogel prepared from pure EFB pulp was called EFBH. The cellulose hydrogels formed from the 2 h, 4 h, and 6 h acid hydrolysis EFB pulp samples were named AHEH-2h, AHEH-4h, and AHEH-6h. The cellulose hydrogels fabricated from 2 h, 4 h and 6 h thermal hydrolysis EFB pulp were labelled THEH-2h, THEH-4h, and THEH-6h. A portion of the hydrogel sample was freeze dried for 48 hours and stored in desiccators for further characterization. The undissolved cellulose was then cleaned and dried in a vacuum oven at 80 oC for 12 h in order to determine the percentage of cellulose solubility. where Wd and Ws are the weights of hydrogel before and after immersion, respectively. Four replicates of each sample were tested for different parameters, and the average values are reported. Figure 1 shows the plot of intrinsic viscosity [ŋ] against cellulose concentration [c] for the EFB pulp. The intercept between the two straight lines determined the intrinsic viscosity of the EFB to be 371.7 (mL∙g-1). Mŋ of the EFB pulp, AHE samples, and THE samples were calculated from the Mark-Houwink equation, as expressed in Eq. 5, while their degree of polymerization (DP) was found using [ŋ], as described in Eq. 6. The computed values of Mŋ and DP for EFB pulp are 1.75 x 105 and 2359, respectively. Table 1 shows the values of [ŋ], Mŋ, and DP of EFB pulp, AHE samples, and THE samples that had undergone acid hydrolysis and thermal hydrolysis at different reaction times. The values of Mŋ and DP were obtained from the [ŋ], and these values were positively correlated with the values of [ŋ]. The AHE samples and THE samples show a lower Mŋ and DP than EFB pulp because the acid hydrolysis and thermal hydrolysis pretreatment reduced the Mŋ and DP of the EFB pulp. The Mŋ of EFB was successfully reduced from 1.75 x 105 to 1.63 x 105, 1.47 x 105, and 1.25 x 105 after acid hydrolysis pretreatment for 2 h, 4 h, and 6 h, respectively. The acid hydrolysis pretreatment was able to reduce the Mŋ of EFB pulp up to 0.5 x105 in 6 h of reaction time. The Mŋ and DP of EFB decreased gradually as the acid hydrolysis reaction time on EFB increased. In acid hydrolysis pretreatment, cellulose undergoes degradation because of the hydrolytic cleavage of polymer glycosidic linkages occurring within accessible regions of the molecules (Adel et al. 2010). Moreover, it is believed that the hydrolysis mechanism led to a scission of glycosidic bonds, which was originally catalyzed by the action of protons (H+) existing in the aqueous medium (Najafpour et al. 2007). The H+ ions in the aqueous medium also helped in breaking down the molecular chain of EFB cellulose, and further disintegrated the fibers as the acid hydrolysis pretreatment time increased (Kargarzadeh et al. 2012). This is because during the heterogeneous cellulose hydrolysis pretreatment, acid will first penetrate into the disordered regions of cellulose. The subsequent attack is mainly on the crystallite, which breaks down gradually, and hence leads to the decrease in the DP of cellulose (Fan et al. 1987). The Mŋ and DP of THE samples displayed a downward trend with respect to the thermal hydrolysis reaction time. After thermal hydrolysis, the Mŋ of EFB pulp (1.75 x 105) could be reduced to as low as 1.32 x105 in 6 h thermal hydrolysis, with significant reduction up to 0.43 x105. As the thermal hydrolysis pretreatment time increased, the Mŋ and DP of EFB decreased regularly. Therefore, the thermal hydrolysis on cellulose was shown to be capable in reducing the Mŋ and DP of cellulose. This is because when water reaches high temperatures (150 to 230 °C) the H-bonding begins to weaken, allowing the autoionization of water into acidic hydronium ions (H3O+) that behave as catalysts and basic hydroxide ions (OH–). The hydronium ions will hydrolyze the cellulose and lead to the reduction of cellulose Mŋ. Hence, thermal hydrolysis promotes the cell structures penetration, cellulose hydration, and hemicelluloses depolymerisation (Ruiz et al. 2013). However, in comparison to thermal hydrolysis, acid hydrolysis proved to be a more efficient treatment in reducing the Mŋ and DP of EFB at the same pretreatment time. Figure 2 shows the XRD patterns of the (a) EFB pulp, (b) AHE-2h pulp, and (c) THE-2h pulp. The XRD patterns for AHE and THE samples in both 4 h and 6 h (not shown) exhibit the same behaviour as that of 2 h samples. The diffraction peaks of all samples appeared at 2θ = 15.23°, 22.53°, and 34.48°, which indicates the phase of the cellulose I in EFB pulp, AHE pulp, and THE pulp. The CrI (%) of EFB, AHE-2h, AHE-4h, AHE-6h, THE-2h, THE-4h, and THE-6h was 34.3 ± 0.8, 25.4 ± 0.3, 21.8 ± 0.8, 20.9 ± 1.0, 26.1 ± 0.5, 23.9 ± 1.0, and 22.4 ± 0.9, respectively. The EFB pulp possessed the highest CrI compared to AHE and THE samples that had undergone acid hydrolysis and thermal hydrolysis, respectively. At the same hydrolysis pretreatment time, the CrI of THE samples was higher than AHE samples. In both hydrolysis pretreatments, the increase in hydrolysis time led to the decreased cellulose CrI. During the acid hydrolysis and thermal hydrolysis treatments, cellulose is expected to preferentially dissolve the amorphous zone under the conditions used in this study. In this phenomenon the H+ ions penetrate into the amorphous regions of cellulose which promote the hydrolytic cleavage of glycosidic bonds and the release of individual crystallites. It was found that the CrI of cellulose was related to the Mn of the cellulose. The hydrolysis pretreatment time enhances the breaking down of the cellulose molecular chain, and reduces the CrI of cellulose (Kargarzadeh et al. 2012). During the hydrolysis pretreatment, the crystallites in cellulose will break down gradually and the DP in cellulose will also decrease gradually (Fan et al. 1987). where S is solubility of cellulose, W is the weight of undissolved cellulose residue, and Wo is the original weight of the cellulose (Gan et al. 2014). Table 2 indicates the average solubility percentage of 3 wt. % cellulose samples in LiOH/urea aqueous solution. From the observations, the samples that had undergone pretreatment obtained a higher solubility compared to untreated EFB pulp. As the pretreatment time of each hydrolysis on cellulose increased, the average solubility of cellulose increased. The AHE samples had slightly higher solubility than THE samples, which was mainly due to the higher Mŋ reduction of AHE samples. Cellulose samples with higher Mŋ have a more packed network, which is more difficult to dissolve in alkaline aqueous solution. This suggests that upon hydrolysis pretreatment, the inter-molecular hydrogen bondings between the cellulose molecules had been destroyed and were easier to penetrate into the cellulose chain. Thus, the cellulose expanded to a higher swollen and dissolution state (Cai and Zhang 2005). For 6 h hydrolysis times, acid hydrolysis increased the solubility of EFB up to 34.3%, while thermal hydrolysis improved to 31.9% of EFB solubility. This finding demonstrated that both hydrolyses are capable of enhancing the solubility of cellulose but the acid hydrolysis is slightly more efficient in improving the solubility of cellulose when compared to thermal hydrolysis. Figure 3 shows the XRD patterns of (a) EFB, (b) EFBH, (c) AHEH-2h, and (d) THEH-2h. The XRD patterns of AHEH and THEH samples in both 4 h and 6 h (not shown) were similar to the 2 h samples. 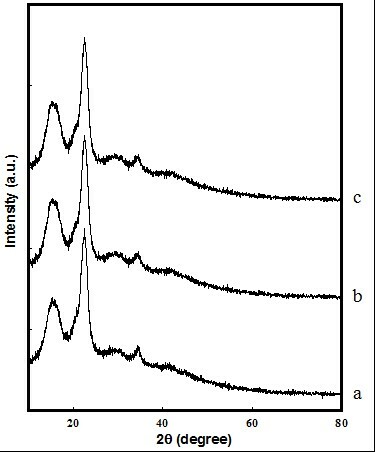 The EFB pulp displayed diffraction peaks of cellulose I at 2θ = 14.9o, 16.3o, 22.6o, and 34.5o, and could be assigned to cellulose crystal planes of (1 ī 0), (1 1 0), (2 0 0), and (0 0 4), respectively (Lu and Hsieh 2012). The CrI of regenerated cellulose hydrogel cannot be obtained because the chemical crosslinking of cellulose with epichlorohydrin occurred during the formation of cellulose hydrogel, which caused the destruction of the initial crystalline structure of cellulose (Chang et al. 2009). Figure 3 exhibits the shift peak from cellulose I to cellulose II, which indicates the formation of cellulose II in hydrogel samples. These hydrogel samples show a broad peak around 19.88° that represent the structure of cellulose II (Wong et al. 2009). However, the broad peak displays the destruction of cellulose crystal structure from the formation of cellulose hydrogel which involves the breaking of hydrogen bonds. This process encourages the formation of amorphous regions in the hydrogel structure (Zhang et al. 2010a; Ding et al. 2012). The percentage of transparency (%) of EFBH, AHEH-2h, AHEH-4h, AHEH-6h, THEH-2h, THEH-4h, and THEH-6h are presented in Table 3. The light transmittance through cellulose hydrogel was measured using an UV-Vis spectrophotometer. The transmittances of ultraviolet and visible light of cellulose hydrogel are measured in the wavelength range between 200 to 800 nm. The EFBH shows higher transparency than both AHEH and THEH samples. At the same pretreatment time, THEH samples obtained higher transmittances than AHEH samples. The transmittance of the AHEH and THEH samples decreased as the hydrolysis reaction time was increased. Furthermore, AHEH-6h and THEH-6h samples that had undergone the longest reaction time exhibited the lowest transmittance (%) compared to other AHEH and THEH samples, respectively. As the solubility of the sample increased, the cellulose content dissolved in alkaline aqueous solution increased, which formed a higher packed network in the cellulose hydrogel. This resulted in the decrease of cellulose hydrogel transparency, as reported previously (Chang et al. 2010). This is probably due to more extensive aggregation of cellulose chains when the hydrogel is prepared from relative higher content of cellulose. The transmittance is mainly dependent on the amount of light to transmit through the cellulose hydrogel structure, hence, transmittance decreases when the light has difficulty to transmit through the hydrogel sample (Chan et al. 2008). The percentage of DS (%) of EFBH, AHEH-2h, AHEH-4h, AHEH-6h, THEH-2h, THEH-4h, and THEH-6h are shown in Table 4. The EFBH had the lowest DS compared to the AHEH and THEH samples. This is owed to the fact that AHEH and THEH samples obtained greater porosity due to their lower Mŋ. Therefore, water could penetrate the cellulose structure more easily and approaches equilibrium after a certain period of time. This was also due to the fact that a cellulose sample with higher solubility will have higher cellulose content in the solution and its hydrogel, thus leading to more adsorption of water. It can also be seen that AHEH samples exhibited higher DS than THEH at the same pretreatment time. This is due to the lower Mŋ of AHEH samples, which resulted in less packed structures among the cellulose hydrogel (Ganji et al. 2010). The swelling mechanism was primarily due to the diffusion of water that fills the pores in cellulose hydrogel. As the hydrolysis pretreatment time on EFB increased, the DS of each AHEH and THEH sample increased. This is also because the increase of hydrolysis time will lower Mŋ of cellulose, which results in a more porous structure of cellulose hydrogel, and allows more water to be retained in cellulose hydrogel. Figure 4 shows the FESEM images of the cross section of the cellulose hydrogel samples (a) AHEH-2h, (b) THEH-2h, (c) AHEH-4h, (d) THEH-4h, (e) AHEH-6h, and (f) THEH-6h. The porosity of THEH was higher than the AHEH samples, which might be due to the method of pretreatment. From observation, the cellulose hydrogel samples obtained macroporous structure, where its average pore size increased as the hydrolysis pretreatment time on cellulose increased. As explained above, this is due to the reduced Mŋ of cellulose during the pretreatment, which improves the solubility of cellulose samples. Through acid hydrolysis and thermal hydrolysis pretreatment, the molecular chains of cellulose break down and decompose into shorter chains. This suggests that more water can be retained in the cellulose hydrogel at longer hydrolysis reaction times which leads to an increase in the pores size. All the hydrogel samples displayed a homogenous pores distribution. This phenomenon shows that as the molecular chain of cellulose became shorter, the solubility of cellulose became higher, and the morphology of the cellulose hydrogel became more porous (Qi et al. 2008). This study also indicates that the solubility of cellulose is strongly dependent on the molecular chain of cellulose, thus influencing the morphology of the hydrogel. As the hydrolysis pretreatment time became longer, the Mŋ of EFB was reduced gradually. This implied that the solubility of EFB with 6 h pretreatment (AHE-6h and THE-6h) achieved cellulose solubility up to 93.7 % and 91.3 %, respectively. Acid hydrolysis was slightly more effective in reducing the Mŋ and improving the dissolution of cellulose compared to thermal hydrolysis. However, thermal hydrolysis is a more environmental friendly method since it doesn’t involve any chemicals in the pretreatment process. Both acid hydrolysis and thermal hydrolysis improved the properties of regenerated cellulose products. The authors thank Universiti Kebangsaan Malaysia for the financial support via the research project grants LRGS/TD/2012/USM-UKM/PT/04, ERGS/1/2012/STG05/ UKM/01/4, and the Ministry of Higher Education Malaysia for MyBrain15-MyMaster Scholarship. The authors are also thankful to the Centre for Research and Instrumentation Management at UKM for the XRD and FESEM testing. Fan, L., Gharpuray, M. M., and Lee, Y. (1987). Cellulose Hydrolysis, Springer, Berlin. Ganji, F., Vasheghani-Farahani, S., and Vasheghani-Farahani, E. (2010). “Theoretical description of hydrogel swelling: A review,” Iranian Polymer Journal 19, 375-398. Jacobsen, S. and Wyman, C. (2000). “Cellulose and hemicellulose hydrolysis models for application to current and novel pretreatment processes,” Twenty-First Symposium on Biotechnology for Fuels and Chemicals. Applied Biochemistry and Biotechnology, Finkelstein, M., and Davison, B. (eds. ), Humana Press, pp. 81-96. Article submitted: June 30, 2015; Peer review completed: October 13, 2015; Revised version received and accepted: October 23, 2015; Published: November 9, 2015.